Vanessa O'Loughlin © 9 May 2013. Posted in the Magazine ( · Interviews · Special Guests · Women's Fiction ). The Sea Sisters is Lucy Clarke’s debut novel, and it’s one of those books that continues to resonate in your head long after you’ve put it down. The story focuses on sisters Mia and Katie – Mia has gone travelling, and Katie’s world is shattered by the news that her headstrong and bohemian younger sister has been found dead at the bottom of a cliff in Bali. The authorities say that Mia jumped—that her death was a suicide. Katie refuses to accept that her sister would have taken her own life, so she leaves behind her orderly, sheltered life in London and embarks on a journey to find out the truth. With only the entries of Mia’s travel journal as her guide, Katie retraces the last few months of her sister’s life, and—page by page, country by country—begins to uncover the mystery surrounding her death. . . .
Lucy Clarke grew up beside the sea, and not surprisingly in this book, the sea is a strong theme. As Lucy reveals on her website: “I feel an almost gravitational pull towards the coast. I love everything about the sea – the pure smell of salt-air, the mirror-calm of a dawn sea, the promise of an empty horizon. My favourite place to write, where I have my clearest thought, has always been by the sea. Lucy’s husband James is a professional windsurfer and she has travelled with him to all the places mentioned in The Sea Sisters, including Bali where much of the book is set. The sense of place is almost tangible throughout the book, from Cornwall to London, to Western Australia, her descriptions are brilliant yet apparently effortless, picking up on minute detail to paint the picture for the reader. She told me, “When I’m editing I draw a five pointed star at the top of the page with the five senses written at each one of its points. It reminds me to give every scene a peppering of the senses.” And Lucy’s ability to evoking place using the five senses is superb, the smells and sounds of Bali particularly, bringing the island alive with all its colour and heat. At the core of The Sea Sisters is the tempestuous relationship between Katie and Mia, yet Lucy doesn’t have a sister of her own. “I don’t actually have a sister, and although I do have a brother I’m close too, it’s a different relationship. The book started with the idea of a travel journal, that was the hook, but I didn’t want to write it as a journal – I needed a way to tell the story of the journal and I started wondering who would be reading it. The sisters just felt right for me. I interviewed lots of different sisters, chatting to them about their relationship. But it was the things they didn’t say that was interesting, the way they interrupted each other, their body language. Although she studied creative writing at University, Lucy told me that she didn’t have time when she started her first book to do courses or classes – instead she told me, “I devoured every ‘how to write a novel’ book that has ever been written”. Even now on her second book, she looks over them all the time. She also analyses the fiction she reads, annotating everything as she goes along, looking at how the writer builds tension, character and introduces flashbacks. This process has definitely payed off in The Sea Sisters – there are several scenes, including the last one, that have you gripping your seat. From that very first chapter of The Sea Sisters, Lucy takes the reader on Katie and Mia’s turbulent journey, the story of their own relationship and their relationships with the men in their lives twisting in unexpected and surprising directions that literally keep you hooked to the last page. It is a great read, and one that you won’t easily forget. Lucy Clarke is undoubtedly a talent to watch. 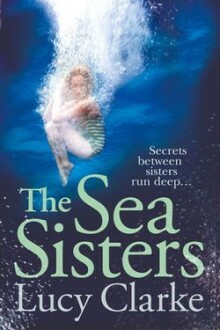 The Sea Sisters is available in all good bookshops and online. To find out more about Lucy as her gorgeous website click here.